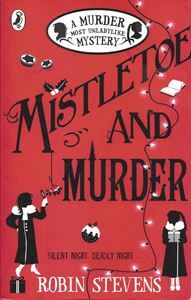 It's Christmas, the snow is falling in Cambridge where the detective duo Daisy Wells and Hazel Wong are spending the festive period. But Hazel's hopes of relaxing amongst the beautiful spires, cosy libraries and inviting tea-rooms are dashed by the danger lurking in the dark stairwells of Maudlin College. Two days before Christmas, there is a terrible accident. At least, it appears to be an accident - until the Detective Society look a little closer, and realise a murder has taken place. Faced with several irritating grown-ups and fierce competition from a rival agency, they must use all their cunning and courage to find the killer (in time for Christmas Day, of course).